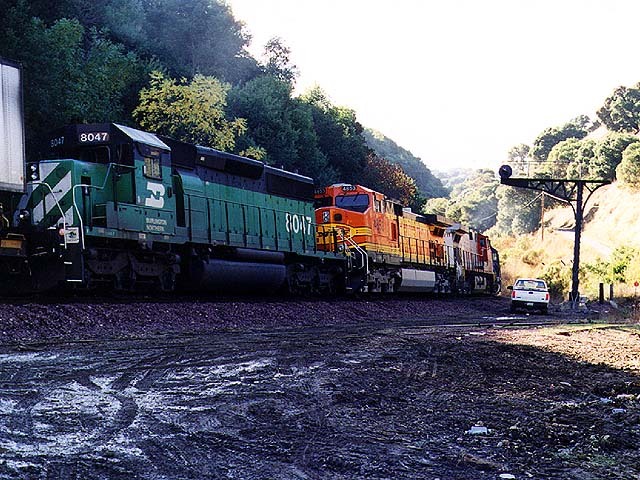 Tucked into the hills of Franklin Canyon near Martinez, California, you will find one of the more unusual sights on the BNSF Stockton Subdivision. This heavily shaded and brushy area is accessible from Franklin Canyon Road, although you have to look sharp to find it. Here the track snakes its way west through the canyon in an S-shaped pattern, then rounds a bend into the mile-long Tunnel No. 3, the last of three tunnels on the line. If you head up McHarry Ranch Road, located just west of where the track bends, and drive up the steep incline you can get a decent view of the tunnel portals. In mid-November 1998, a westbound freight train rolls past the cantilevered signal and heads west for Tunnel No. 3. Photo by Roni Gehlke. This page was last updated Sunday, June 20, 1999 at 01:20 hrs.